Guatemala Ceety (in full, La Nueva Guatemala de la Asunción; locally kent as Guatemala or Guate), is the caipital an lairgest ceety o the Republic o Guatemala. It is an aa the caipital ceety o the local Guatemala Depairtment an the lairgest ceety in Central Americae. The ceety is locatit at 14°38′N 90°33′W﻿ / ﻿14.633°N 90.550°W﻿ / 14.633; -90.550, in a muntain valley cawed Valle de la Ermita in the sooth central pairt o the kintra. Athin the confines o modren Guatemala Ceety is the auncient Maya ceety o Kaminaljuyu. Kaminaljuyu wis first occupied atween 1200 an 1000 BC an the ceety continued tae be inhabitit for aboot 2000 years afore it wis abandoned in the Late Classic Period o Mesoamerican chronology (600–900 AD). It is ane of Americae's maist notable archaeological steids. The centre o Kaminaljuyu wis locatit a short distance frae the auldest pairt o Guatemala Ceety. Housomeivver, in the late 20t century, the ceety grew aroond the ruins, an, in some cases, ower some o the ootlyin ruins afore thay wur protectit. Mony o the several hunder temple mounds hae been biggit ower wi freeways, shoppin centres, commerce, luxury hotels an residential auries. The central ceremonial centre o Kaminaljuyu wis housomeivver protectit bi the Guatemalan govrenment an is nou a pairk athin the ceety. Thare are an aa mony ruins still in existence, protectit bi the govrenment. Metropolitan Cultural Centre (auld Naitional Post Office Biggin). In Spainyie colonial times, Guatemala Ceety wis a sma toun. It haed a monastery cawed El Carmen, foondit in 1629. The caipital o the Spainyie Captaincy General o Guatemala, coverin maist o modren Central Americae, wis muived here efter a series o earthquakes - the Santa Marta earthquakes that stairtit on 29 Julie 1773 - destroyed the auld caipital, Antigua Guatemala. On 27 September 1775, Keeng Charles III o Spain officialised the muivin o the caipital. This dramatically increased the potential for expansion o the ceety. Guatemala Ceety wis the scene o the declaration o unthirldom o Central Americae frae Spain, an became the caipital o the Federal Republic o Central Americae in 1821. Guatemala Ceety is the economic, govrenmental an cultural caipital o the Republic. The ceety an aa functions as the main port o entry intae the kintra, wi internaitional airport, La Aurora Internaitional Airport an maist major hieweys in the kintra oreeginatin or leadin tae the ceety. In addition tae a wide variety o restaurants, hotels an shops, the ceety haes a wide variety o airt galleries, theatres, sports venues an museums (includin some fine collections o Pre-Columbie airt) an continually affers an increasin amoont o cultural activities. Guatemala Ceety affers aw the modren amenities alang wi important historic steids that a warld cless ceety can be expectit tae hae rangin frae an IMAX Theatre tae the Ícaro film festival (Festival Ícaro) featurin film producit in Guatemala an Central Americae. The ceety continues tae be a pole for the attraction o immigrants frae the kintra's rural auries as well as foreign immigrants. Despite its location in the tropics an the mony micro climates foond athin the kintra, Guatemala Ceety’s elevation an the resultin moderating influence o the heicher altitude enable it tae enjoy a subtropical hieland climate (Köppen Cwb), tho dependin on location, it borders on a tropical savanna climate (Köppen Aw) an aw. Guatemala Ceety is generally mild, amaist springlike, throuoot the course o the year. It occasionally gets wairm durin the dry saison, but no as het as ither sea-level ceeties locatit in the tropics. The hettest month is Apryle. The rainy saison extends frae Mey tae October while the dry saison covers the remainder o the year. The ceety is vera windy an aw, which mey decrease the apparent temperatur. The average annual temperatur ranges frae 22 tae 28 °C (72 tae 82 °F) durin the day, an 12 tae 17 °C (54 tae 63 °F) at nicht. Average fore-nuin relative humidity: 82%, fore-nuin relative humidity: 58%. Average dew point is 16 °C (61 °F). Guatemala Ceety is subdividit intae 22 zones designed bi the urban ingineerin o Raúl Aguilar Batres, each ane wi its awn streets an avenues, makkin it pretty easy tae find addresses in the ceety. Zones are nummered 1-25 wi Zones 20, 22 an 23 no existin as thay wad hae fawen in twa ither municipalities territory. Addresses are assigned accordin tae the street or avenue nummer, follaeed bi a dash an the nummer o metres it is awa frae the intersection further simplifeein address location. The zones are assigned in a spiral form stairtin in dountoun Guatemala Ceety. The ceety's metro aurie haes recently grown vera rapidly an haes absorbit maist o the neebourin municipalities o Villa Nueva, San Miguel Petapa, Mixco, San Juan Sacatepéquez, San José Pinula, Santa Catarina Pinula, Fraijanes, San Pedro Ayampuc, Amatitlán, Villa Canales, Palencia an Chinautla formin wha is nou kent as the Guatemala Ceety metropolitan aurie. Zone Ane is the Historic Centre, (Centro Histórico), lyin in the vera hert o the ceety, the location o mony important historic biggins includin the Palacio Nacional de la Cultura (Naitional Palace o Cultur), the Metropolitan Cathedral, the Naitional Congress, the Casa Presidencial (Presidential Hoose), the Naitional Librar an Plaza de la Constitución (Constitution Plaza, auld Central Pairk). Efforts tae revitalize this important pairt o the ceety hae been unnertaken bi the municipal govrenment an hae been vera successfu sicweys far. In an attempt tae control rapid growthe o the ceety, the municipal govrenment (Municipalidad de Guatemala) heidit bi langtime Mayor Álvaro Arzú, haes implementit a plan tae control its growthe based on transects alang its important airterial roads an exhibittin Transit-orientit development (TOD) characteristics. This plan denominatit POT (Plan de Ordenamiento Territorial) aims tae allou tawer biggin structurs o mixed uisses tae be biggit next tae lairge arterial roads an gradually decline in hicht an density as you muive awa frae sic. It is wirth mentioning an aw, that due tae the Airport bein in the ceety, tae the sooth, mony Aeronautic Hicht Leemits hae been applee'd tae the construction code. This leemits the maximum hicht for a biggin, at 60 Metres in Zone 10, up tae 95 Meters in Zone 1. The ceety is locatit in the Sooth-Central aurie o the kintra an haes a lot o green auries. The ceety affers a portfolio o enterteenment in the region, focused on the sae-cried Zona Viva an the Calzada Roosevelt as well as fower degrees north. The activity o Casinos is great an possesses several locatit in different pairts o the Zona Viva, awtho east mercat is still in the stage o initiation, awtho the date haes been restructurin this aurie an is becomin mair modren. Well as an endless shoppin maws an Maw's that haes the ceety, the main Maw's which we can mention are: Galerías Miraflores, Oakland Maw, Portales, Pradera Concepción, Metrocentro o Villa Nueva; Shoppin maws; Plaza Fontabella, The Village, Majadas, Los Próceres, Bonus Galleries, Via Majadas, Maw o zone 4, Tikal Futura, Galerías Primma, Metronorte, Korea Center, Geminis 10, Unicentro, Plaza del Naranjo, Galerías Pradera, Pacific Center, Metrosur, Century Plaza, Los Manantiales, Peri-Roosevelt, Gran Via Roosevelt, Santander Commercial Plaza, Quinta Samayoa, Gran Via, Eskala Roosevelt, Megacentro amang ithers. Ane o the maist ootstaundin mayors wis the ingineer Martin Prado Vélez, who teuk ower in 1949, an ruled the ceety durin the reformist Preses Arevalo an Arbenz. O cobanero oreegin, marriet wi Marta Cobos, he studiet at the Varsity o San Carlos. Unner his tenur, amang ither modrenist wirks o the ceety, it wis biggit or stairtit the El Incienso brig, the construction o the Roosevelt Avenue, the main road axis frae east tae wast o the ceety, the toun haw biggin, an numerous road wirks which meant the widenin o the colonial ceety, its order in the cardinal pynts an the generation o a ring road wi the first Shamrock in the main ceety o Central Americae. In the financial destrict are the tawest biggins in the kintra includin: Club Premier, Tinttorento, Atlantis biggin, Atrium, Tikal Futura, Building of Finances, Touers Building Batteries, Torres Botticelli, Tadeus, building o the INTECAP, Royal Touers, Touers Geminis, Industrial Bank touers, Holiday Inn Hotel, Premier o the Americas, amang mony ithers tae be uised for offices, apairtments etc. An aw include projects sic as Zona Pradera an Interamerica´s Warld Financial Center http://www.interamericaswfc.com. The location o the La Aurora internaitional airport athin the ceety leemits the construction o skyscrapers, chyngin the leemits permittit directly bi its location athin the urban aurie. Skyline o the zone 14 or residential biggins zone. As o the 2002 census, the metropolitan aurie haed a population o 2.3 million. Guatemalans hae a diversity o oreegins, wi Spainyie an Mestizo strynd bein the maist common. Biggins in Guatemala Ceety as seen frae La Aurora Int'l Airport Concourse wi the auld historic airport in the forefront. Guatemala Ceety is subdividit intae 22 zones designed bi the urban ingineerin o Raúl Aguilar Batres, each ane wi its awn streets an avenues, makkin it vera easy tae find addresses in the ceety. Zones are nummered 1-25 wi Zones 20, 22 an 23 no existin. Centro Histórico Site in Spainyie. Torre del Reformador (Touer o the Reformer). Zone 10, alang wi bein the financial destrict o the ceety, is amang the maist popular auries for pop cultur, shopping an entertainment. A destrict within Zone 10, kent as Zona Viva, contains mony o the ceety's maist popular an maist expensive hotels, restaurants, bars, nightclubs, an ither entertainment venues for urban dwellers. An aa, mony o the embassies are locatit in Zone 10. Museo Miraflores , Miraflores ane o the biggest maws in the ceety an Central Americae. Guatemala Ceety possesses several sportsgrunds an is hame tae mony sports clubs. fitbaa is the maist popular sport, wi CSD Municipal, Aurora FC an Comunicaciones bein the main clubs. The Estadio Mateo Flores, locatit in the Zone 5 o the ceety, is the lairgest stadium in the kintra, follaed in capacity bi the Estadio Cementos Progreso an the Estadio del Ejército. An important multi-functional hall is the Domo Polideportivo de la CDAG. The ceety haes hostit several promotional functions an some internaitional sports events: in 1950 it hostit the VI Central American an Caribbean Gemmes, an in 2000 the FIFA Futsal Warld Championship. On Julie 4, 2007 the Internaitional Olympic Committee githered in Guatemala Ceety an votit Sochi tae acome the host for the 2014 Winter Olympics an Paralympics. In Apryle 2010, it hosted the XIVth Pan-American Moontain Bike Championships. Guatemala Ceety wis annoonced in November 2007 tae host the 2008 edition o the CONCACAF Futsal Championship, played at the Domo Polideportivo frae Juin 2 tae Juin 8, 2008. ↑ Sharer & Traxler 2006, pp.194-195. ↑ José Omar Moncada Maya. "En torno a la destrucción de la ciudad de Guatemala, 1773. Una carta del ingeniero militar Antonio Marín". Ub.es. Retrieved 2009-07-08. ↑ "guatemala". Retrieved 16 August 2018. ↑ 5.0 5.1 "Plan de Ordenamiento Territorial - Tú eres la Ciudad, Municipalidad de Guatemala, cumple" (in Spaingie). Pot.muniguate.com. Retrieved 2009-07-08. 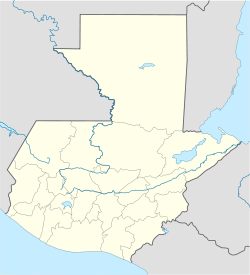 ↑ "Guatemala: metropolitan areas". World Gazeteer. Archived frae the oreeginal on 5 Jan 2013. Retrieved 2010-02-24. ↑ "Mapa en Relieve de Guatemala". Web.archive.org. Archived frae the oreeginal on 2008-02-09. Retrieved 2009-07-25. ↑ "Museo Ixchel". Web.archive.org. 2008-02-02. Archived frae the oreeginal on 2008-02-02. Retrieved 2009-07-25. ↑ "guatemala government and economy". Natureserve.org. Retrieved 2009-07-25. ↑ "Museo Nacional de Arqueologia y Etnologia de Guatemala - deGUATE.com". deGUATE.com<!. Retrieved 2009-07-25. ↑ "guatemala people and culture". anywhere.com. Retrieved 2018-06-16. ↑ Madrid city council webpage "Mapa Mundi de las ciudades hermanadas" Check |url= value (help). Ayuntamiento de Madrid. Retrieved 2009-07-25. Wikimedia Commons haes media relatit tae Guatemala City. This page wis last eeditit on 16 August 2018, at 07:14.